The African Society for Laboratory Medicine (ASLM) and The International Association of National Public Health Institutes (IANPHI) agreed to explore joint development of proposals and applications for potential funding for projects to strengthen laboratory system capacity in national public health institutes at the IANPHI Annual Meeting held in Rome, Italy, 22-25 October 2017. ASLM and IANPHI signed a meeting established a formal collaboration in support of strengthening national public health institutes. These agreements were revisited during the 2017 IANPHI Annual Meeting where ASLM was represented by Dr Amha Kebede, Project Manager and PEPFAR Program Coordinator, and Prof Oni Idigbe, Senior ASLM Consultant. IANPHI‘s vision is to improve the world’s health by bringing together the experience and expertise of its member institutes to build strong public health systems globally. IANPHI connects and supports key national public health institute functions such as disease surveillance, detection, and monitoring; outbreak investigation and control; health information analysis for policy development; research; training; health promotion and health education; and laboratory science. IANPHI currently has 108 members from 93 countries covering every corner of the globe. 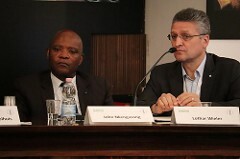 During the Annual Meeting, the ASLM representatives took advantage of a number of opportunities to present ASLM’s initiatives and interest in the potential to collaborate with IANPHI in its effort to strengthen national public health institutes, particularly with regard to national public health laboratory networks. At the Executive Board meeting of IANPHI, Dr Kebede briefed board members on ASLM’s African National Public Health Laboratory Network (APHLN), established in 2014. APHLN currently has 28 member countries that have signed an MOU and is expanding, indicating an enormous potential for collaboration in strategic areas. The already-signed MOU between ASLM and IANPHI was presented to the board along with other ASLM documents. There was a consensus that ASLM and IANPHI should explore funding opportunities together with joint proposals. Dr Kebede made another presentation as part of the plenary session during the official opening of the meeting under the title ‘African Public Health Laboratory Network’. 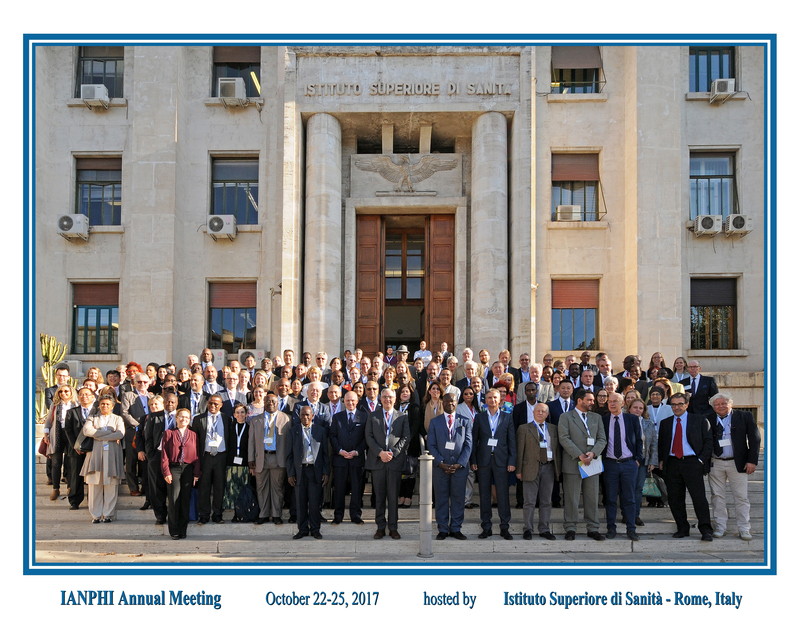 The theme for the plenary was ‘important developments in public health 2017: IANPHI perspectives’ and was a very good opportunity for ASLM to present itself and capitalize on the presence of the leaders from various institutes from more than 93 countries. The panel was organized to share experiences in order to engage in several new initiatives, such as Africa CDC, related to strengthening and mobilization of national public health institutes for regional and global public health improvements. All of these require strong laboratory systems and the capacity to make timely and accurate diagnoses, making the role of ASLM clear. Dr Kebede introduced ASLM to the audience with an emphasis on APHLN and highlighted the great opportunity for this network to contribute to the mission of IANPHI. A brief overview of the ASLM Ambassadors Programme was also given and those interested were invited to get in touch. Prof Idigbe participated in the IANPHI-Africa Leadership Academy, a training workshop held in parallel with the Annual Meeting. 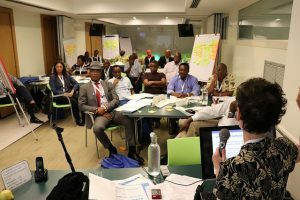 Twenty-five directors of national public health institutes in Africa participated in the workshop, which was facilitated by the IANPHI Secretariat in Atlanta. The workshop focused on institutional leadership strategies for national public health institute executive teams. The thrust was to examine various leadership qualities and for participants to establish their individual leadership style, using the Dominance, Influence, Submission and Compliance (DISC) Classic Personal Profile System. Other areas covered were managing time and people and enhancing personal authority. A short slot was also granted for a presentation on the ASLM Ambassadors Programme. The IANPHI-Africa Regional Meeting was another opportunity to further present ASLM. This meeting was attended by the directors of 21 public health institutes in Africa, as well as 12 guests from the United States CDC, European CDC, Africa CDC, West African Health Organisation, World Health Organization Regional Office for Africa and the IANPHI Secretariat. Most deliberations in the meeting focused on forging strategies to enhance networking and collaborations to strengthen the capacities of member institutes for disease surveillance, as well as emergency preparedness and rapid response to disease outbreaks on the continent. Presentations were made on the Regional Integrated Surveillance and Laboratory Network (RISLNET), the West Africa RIPOST project and the five Africa CDC Regional Coordinating Centres (RCCs). ASLM is pleased to have reinforced its relationship with IANPHI and engaged with many member countries to strengthen their collaboration with ASLM.